With Intel getting ready to launch desktop processors based on its Kaby Lake architecture, motherboard makers are scrambling to make available BIOS updates to ensure compatibility with existing socket LGA 1151 boards. Last week it was Asus, which released 87 UEFI updates for Kaby Lake, and now ASRock is following suit with BIOS updates of its own. 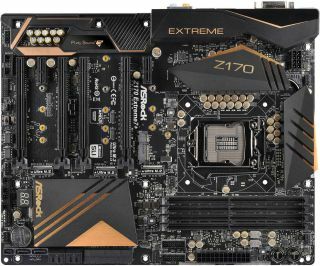 ASRock's LGA 1151 lineup isn't quite as extensive as the company it was spun off from (Asus)—it has BIOS updates for 21 motherboards, including 13 Z170 chipset boards. Like Asus, ASRock doesn't come right out and specifically mention "Kaby Lake," instead saying the BIOS updates are intended to bring support for "next generation Intel processors." Nevertheless, it's no secret that's what they're for. Intel already released Kaby Lake to mobile, at the time mentioning that desktop variants would launch in early 2017. "We are incredibly excited about the strong partnership with our OEM customers and expect more than 100 different 2-in-1s and laptops powered by 7th Gen Intel Core to be available starting in September through this holiday season. We will share more on the rest of the 7th Gen Intel Core family for desktops and enterprise PCs early next year," Intel said. Kaby Lake is the first architecture to disrupt Intel's traditional tick-tock release cadence, in which ticks are new process nodes and tocks are brand new architectures on the same node. It's not a terribly exciting product release in that respect, but it will have to do until Intel is able to release its 10nm Cannonlake architecture, presumably next year. In the meantime, you can grab the latest BIOS update for your 100-series ASRock motherboard here.